When I made this, I wasn't really sure what Justin's reaction would be. 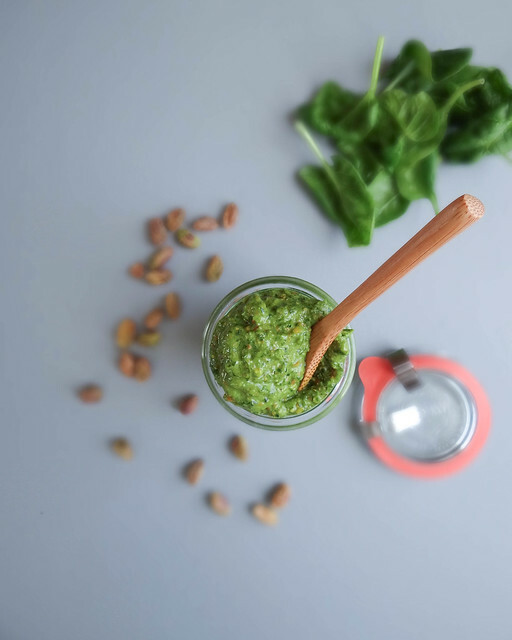 Pesto with him is either a hit or miss - I was surprised when he asked if there was seconds- that's when I know a dish is a "two thumbs up". Another telltale sign that he really enjoys a meal is the leg shake; literally his leg starts bobbing up and down, head down & without conversation other than a smile and a mmm hmm when asked if he likes his meal- his version of a seal of approval, I'll take it! The only thing that was disappointing with this meal was the lack of leftovers - the next go around I will be preparing a double batch to guarantee lunch for the following day. I know some of you have "picky" eaters or tough critics (who love us dearly) - Justin is funny, he likes some foods only prepared certain ways. I am famous for trying to sneak in an ingredient that he has convinced himself he doesn't like and I know he will like it if he just gives it another try in a different way - lets just say we have played our fair share of him: "what's in this?" me: "guess what it is, just take one bite - bet you can't guess!" ; I would say 50% of the time he guesses right. And Thanks to Kristy at keepin' it kind, I finally got him to eat artichokes0 even if they were disguised in a tasty tapenade! How do you handle a picky eater or tough critic? Do you try not to take it personally, knowing that there tastes may be a bit more limited than yours? In a large frying pan heat coconut oil over medium high heat - saute mushrooms until golden brown. Add cooked pasta directly to the frying pan - turn heat off. 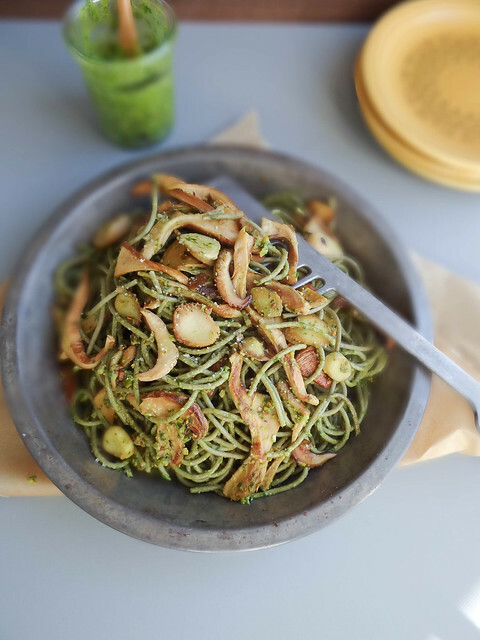 Toss 2-4 tbsp of pesto plus 1/3 cup of pasta water with the pasta and mushrooms, tossing well to coat noodles and mushrooms. Divide between 2 plates and season with salt & pepper to taste. This has so many great colors and textures going on! 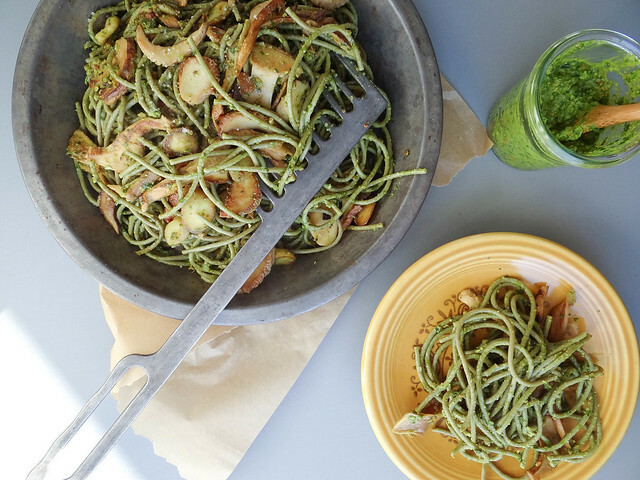 This looks great, do you have a recipe for the pesto? I also love the idea of using coconut oil. 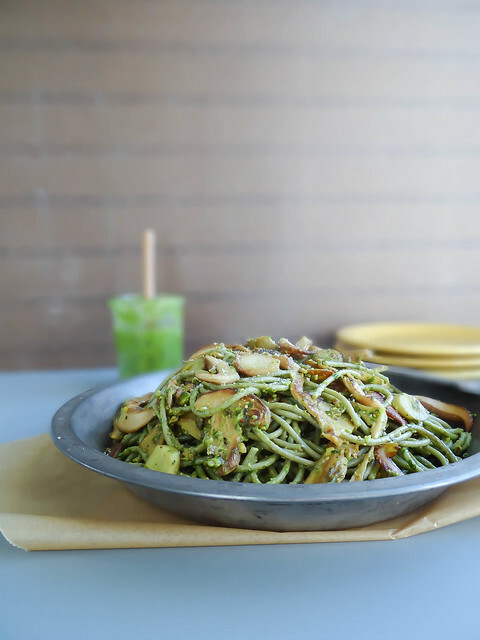 I can eat pasta every single day and this is the kind I like, loaded with pesto! i take criticism from dayv very personally. let's just say when he first became gf vegan, i cried every night for about two months. LOVE this pasta, lady! it's so vibrant and reminds me of spring. 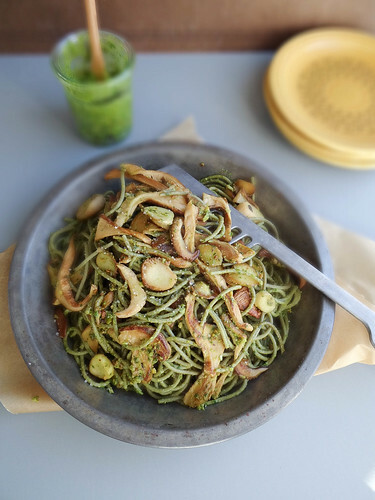 mushrooms and pistachios look SO GOOD thrown in there. i need this. This looks so dang good and comorting and delicious! I'm not even a pasta lover and this is something I could eat a whole bowl of. Wow! And those mushrooms! 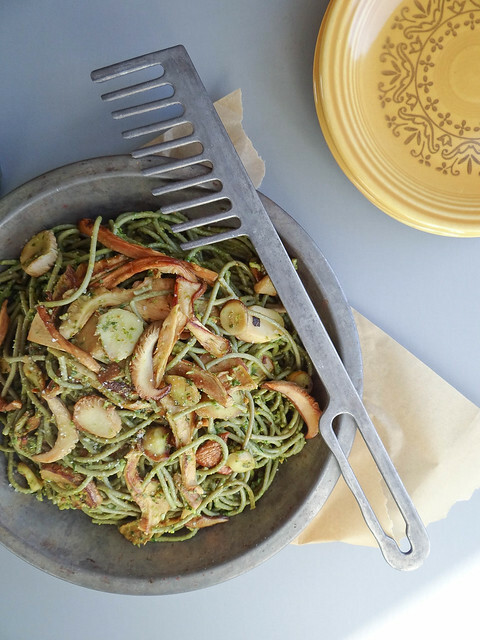 And where did you find that pasta-comb thing? I've never seen one before but it's so cool! vivek isnt particular most days except about some authentic indian stuff. 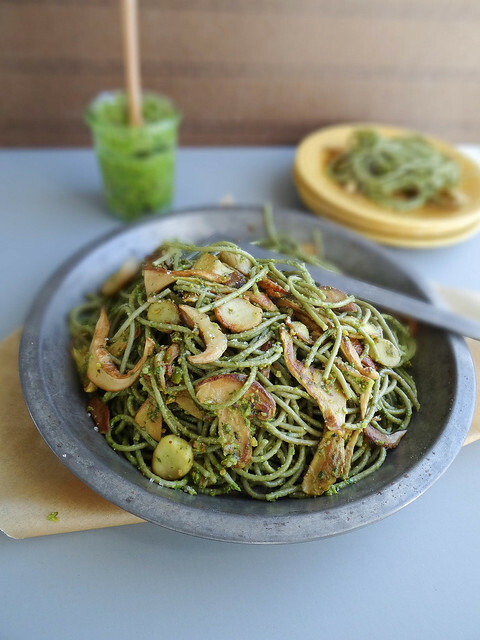 and he loves mushrooms and pesto.. this is perfect dish for him.. the pasta looks so delicious and vibrant! 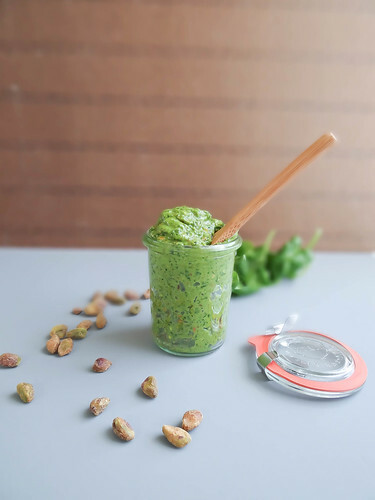 Ooh I knew you would find a tasty use for that pesto! My family is pretty good at giving me honest opinions on the things I make, especially if I'm testing a recipe for my blog and want their feedback. I try to understand that they are being helpful and giving constructive criticism, but it's hard when they don't like a recipe that I like! In some cases, I know that we just have different tastes and my blog readers might still appreciate the recipe! How am I supposed to lose weight with food this yummy? I ate a lot more than I should! 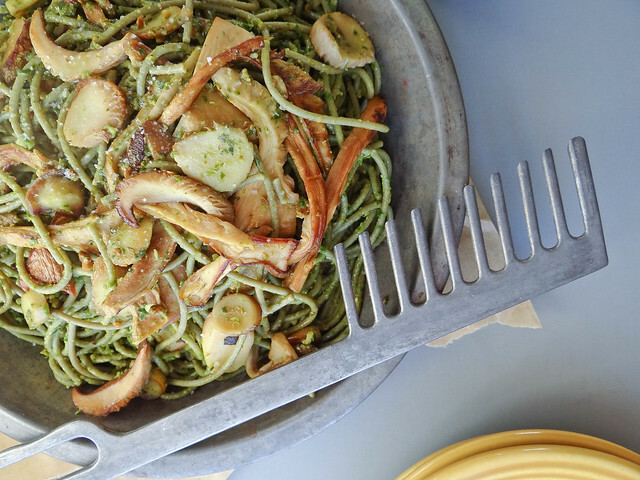 Yah, I wasn't sure how the pesto could get any better, but obviously mushrooms and pasta are the answer. This looks amazeballs! !